The last two weeks have been an absolute blur. This month has been diabetes overload. The new devices that are attached to me are a big reminder of that, although not necessarily in a bad way. My desk is an absolute mess of cable cords, information booklets, carb counting books and test strip containers. Every time I clean it up, I end up needing to pull the stuff out again. 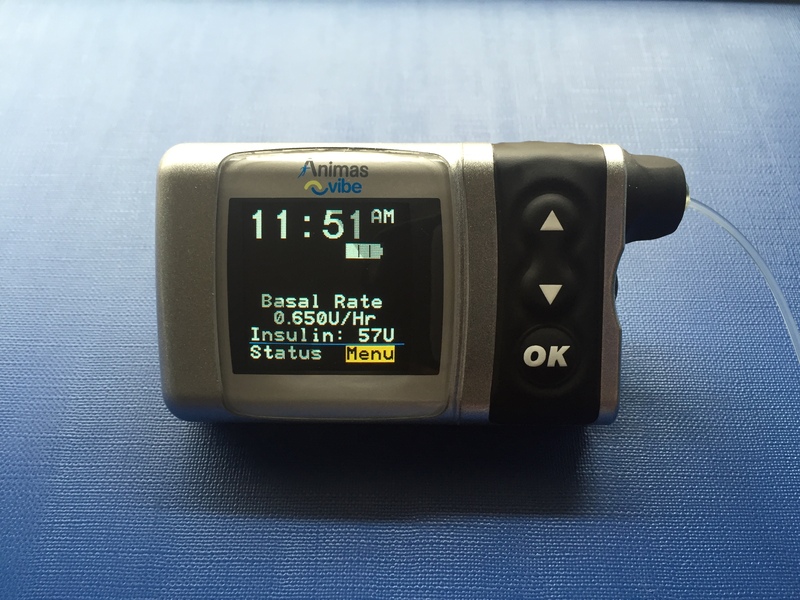 I’ve been asked so many times about how I was feeling in the lead up to insulin pump day. Yet the reality didn’t actually set in until I was at diabetes clinic last Monday morning. Some of the other questions around it, however, have been rather amusing. So when do you go in for your surgery? Is it like a computer that’s strapped to your back? It’ll be quite heavy. Will you still be right to work here? Does the insulin go in through an IV line? They’re going to have to cut you open! They’re going to have to cut you open! It’s so bloody hard to explain what it actually is, so I’m really looking forward to being able to pull out my pump and show everyone. Sidenote: My favourite diabetes hack from Friday’s Diabetes Blog Week prompt goes to Laddie at Test Guess and Go – objects photograph better on colours. The biggest misconception here, is that people thought I was taking time off for a physical recovery after the insulin pump. The truth is, it’s been more of a mental one. I’ve slept over almost every alarm that I’ve set for myself during the night to test, simply because my brain is fried from diabetes. Even harder, is the fact that most people won’t see the huge learning curve of these initial weeks. 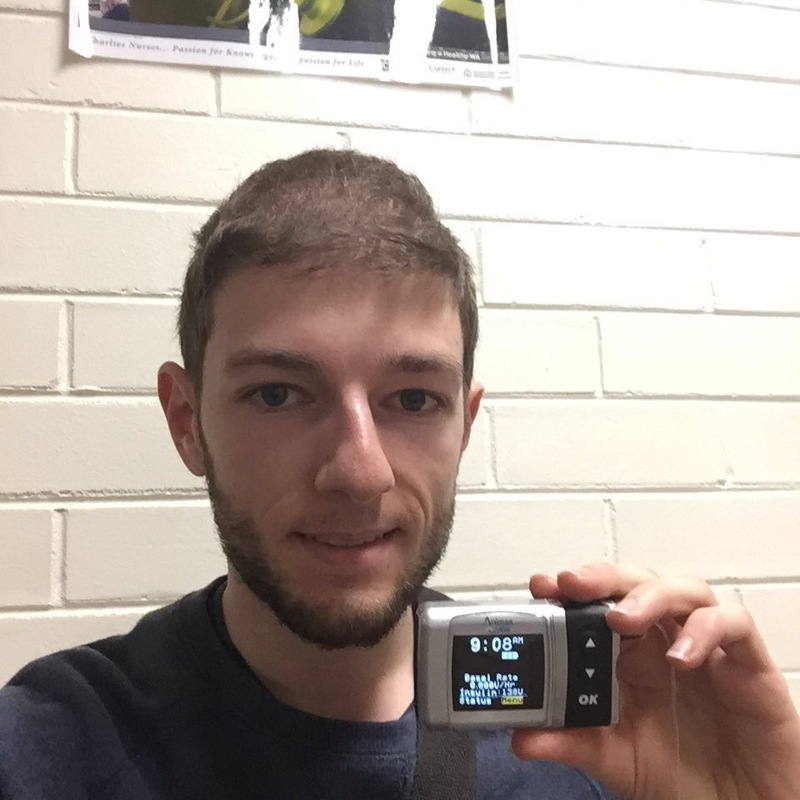 Every night this week, I’ve been putting my overnight basal insulin rate to the test. Seeing if it will hold my BGLs steady, drop me further, or make me spike. Every morning, I’ve plugged my devices into the computer and analysed the results. 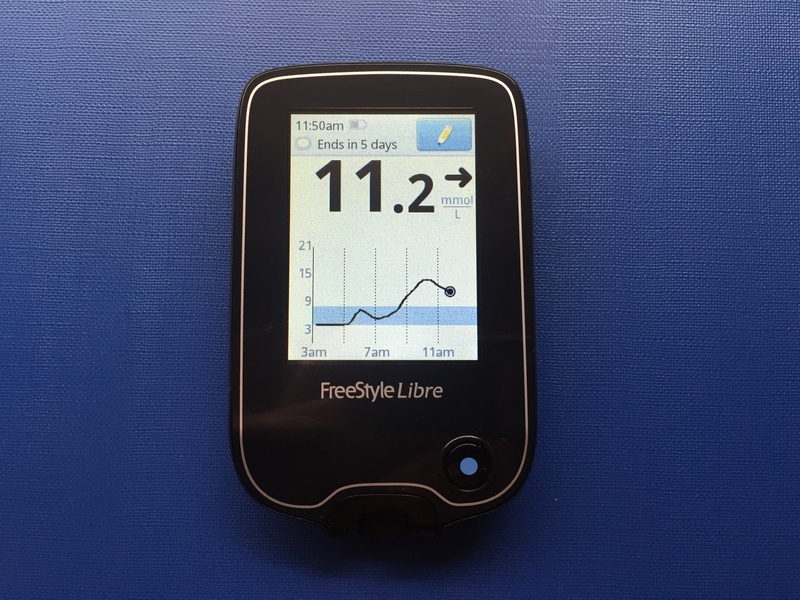 Having access to such detailed data through my FreeStyle Libre (I received a reader and two sensors free of charge – further disclosures are here) has been helpful in tracking the movement of my BGLs overnight, and making changes to my basal insulin rate. It’s also a challenge not to respond to those annoying trend arrows and micromanage data. 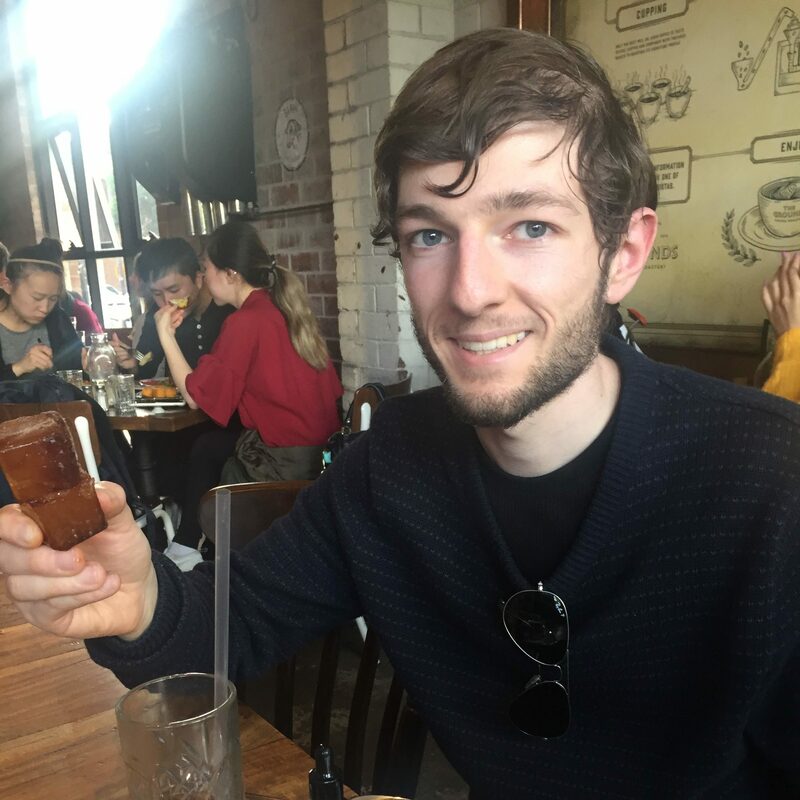 Having both my diabetes educator, and my family to talk it through with each day has been a huge support. I’ve sorely missed my educator’s guiding hand over the weekend, and I hope that I haven’t veered too far away from the road in my decision making. Being home to navigate my way through it this past week has also been a massive relief. But I’m also a little overwhelmed at the new factors that will be thrown into the mix when I head back to work tomorrow. This past week has taken enormous patience. I’ve hardly even made a dent in my homework. Once my overnight basal rate holds me steady, I’ll move onto testing my morning basal insulin rate, where I’ll have to deal with morning cortisol glucose dumps. Then the afternoon, and then the evening. Then fine tune Insulin to Carbohydrate ratios, and correction ratios. It’s hard to remind myself that this will take time to get right. Amongst all of this, it was hard to believe that it was also my birthday yesterday. It was such a relief to have that guidance from the pump in bolussing insulin for my birthday dinner, rather than my lazy guesstimates. It was so nice to simply pull out the pump from my pocket, and push a few buttons to bolus for the cake. The pump is one of the greatest birthday gifts I could have wished for this year. It’s a brand new chapter for my diabetes, and I’m confident the change will be a positive one. Thanks for the shout-out, Frank. Which pump are you using as I’m now allergic to the Omnipod after 2 years of using it … Also having reaction with the freestyle Libre too !!! Animas Vibe. Don’t have the Omnipod in Australia! I’ve been waiting for you to post about how pumping is going! Looks like it’s going just fine, and OMG they didn’t even cut you open! I had a good laugh at that one. OMG I love peoples reactions. I think people get the wrong impression because you have to get admitted to hospital to claim one. It is very tiring when you’re new on a pump, but I’m excited to see what you think the longer you have it. how it work insulin pump ? HAPPY BIRTHDAY FRANK! I’m so glad you got that wonderful birthday pump ;). And very glad you seem to have recovered nicely from the surgery, lol. Great post.